Look at this. It is the Vice-Chancellor's Commercialisation medal. Isn't it nice? It comes with a plinth. This medal is awarded annually to a University staff member who (as it says here in the latest issue of UniNews) has made "an outstanding contribution to industry and society in particular for commericalisation or contract research." You can be in to win one of these medals if you hold a salaried academic or research position at Auckland University and if you have an excellent commercialisation or contract research record with UniServices. In short, if your research has made an outstanding contribution to Auckland University's funds, then you can win a medal, on a plinth. I wonder if there is an award ceremony. 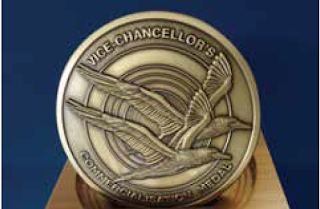 Does the Vice Chancellor pin this medal to the heaving chest of the outstanding contributor; or does he hand it over, on its plinth or in a box full of velvet? Do they have a special dinner, with uniformed waiting staff serving special dishes, such as mess of pottage on a bed of wilted spinach? And what are those birds? Do they have legs or do their bodies taper erratically to a tip? Why are their beaks so large and so prehistoric? Are they some form of flying platypus? And why do they fly so dangerously close? 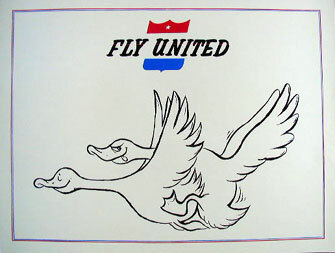 Could the artist have been inspired by the classic Fly United t-shirt of the 1970s? Here is Steve Miller in a truly awful 1976 promo. I do not know what he is sitting on but it looks very uncomfortable.